Attorney General Avichai Mandelblit has intervened, stopping appointments of persons close to Israel’s Chief Rabbis, Rishon L’Tzion HaRav Yitzchak Yosef and HaRav Dovid Lau. Mandelblit has intervened and stopped the appointment of Rabbi Mordechai Ralbag, a brother-in-law of Rabbi Lau, as the new Ravaad Yerushalayim. He also acted on the appointment of Rabbi Mordechai Toledano, a brother-in-law of Rav Yosef, to the post of Av Beis Din Yerushalayim. According to the Yediot Achronot report, the attorney general decided to freeze the two appointments following the approval of the appointments by the special committee that was assigned the task. The committee is comprised of HaGaon HaRav Zabadya Cohen, HaGaon HaRav Binyamin Atias and HaGaon HaRav Michael Amos, with the latter serving on the Chief Rabbinate Supreme Beis Din. 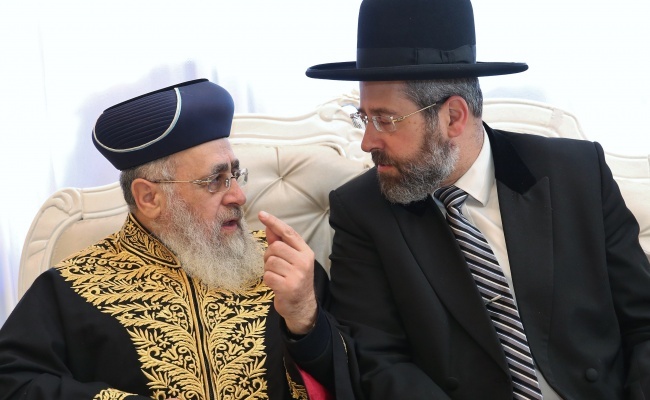 Mandelblit instructed the Chief Rabbis to appoint retired dayanim to the committee, but the Chief Rabbinate ignored the request, explaining they were unable to find retired dayanim to serve on the committee. The problem with the current committee is the rabbonim were appointed by the Chief Rabbis and here too, there is a conflict of interests as they were appointed by the serving Chief Rabbis. According to Yediot’s report, persons in the know explain the committee is nothing more than a “rubber stamp” which will approve any appointments made by the Chief Rabbis. The Justice Ministry was only informed of the members of the committee after the appointments were approved. This has prompted Mandelblit to intervene, freezing the appointments. Yediot quotes officials in the Justice Ministry saying, “Following a request by the Chief Rabbinate’s legal advisor several months ago regarding the appointment of a court president and the head of the courts, it was agreed that candidates who had relatives with one of the chief rabbis would be examined by a committee of retired dayanim. The court administration announced that it had failed to appoint relevant retired dayanim, and therefore the committee was composed of dayanim currently serving. When asked to respond to the report, the administration of the Batei Din is quoted telling Yediot, “The matter is being probed by the Justice Ministry”.